Wow! It has been a pretty busy 4 days at Peregrine Central! The first juvenile fledged shortly after 7 AM on 6/11/2015 and quickly disappeared out of sight and could not be spotted all day. About 12 hours after the first flight s/he dropped down to Gazelle Sports, a popular store in downtown Kalamazoo. 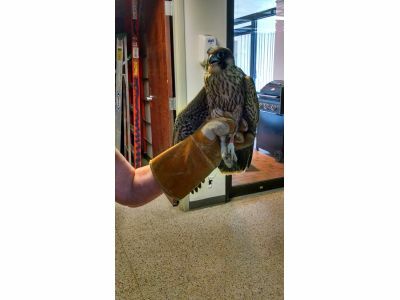 The staff had been alerted earlier that day about the fledging activity of these teenage flyers and quickly determined that he was not looking for a new pair of running shoes, and contacted rehabilitator Sharron Butler, who came to pick him up. Two birds took flight on Saturday 6/13/2015. One in the morning and mid-afternoon. The first bird out was holding onto a lower window ledge of the Fifth Third Building for quite a while. The second bird of the day suddenly just lifted off and followed Rebecca when she soared by. Rebecca circled around the building, but returned without the fledgling. Yours truly went scouting on the trajectory the bird seemed to make, but did not spot it. Upon returning to my post, I got a call telling me the bird was being apprehended by the police and was only a few feet (and 6 stories down) from me near the local public safety station. Disturbing the peace and resisting arrest are now on this bird's record, but the long arm of the law and my cat carrier prevailed. So, again Sharron was called and sprung our young friend from jail as you can see in the photo. The fourth youngster took flight today shortly after noon and could not be seen the rest of the day. One bird (I think the one that fledged on 6/13) was on the adjacent public safety station most of the day and desperately cried for food. Her parents FINALLY relented and Dad brought her a pretty much intact bird and she had to figure out how to dissect it herself. She managed the task with no problem. One of the birds had returned to the parapet by 7 PM tonight (then took a long nap)! The two birds in rehab are doing fine. They are not hurt - just need a bit more practice in a safe setting in order to pass their Flyer's Ed class! So, if you miss seeing all the action on your computer screen and if you are in downtown Kalamazoo, grab your sneakers and go on a Peregrine patrol stroll. This is a critical time for the birds as they learn that the soaring they see Mom and Dad do is not as easy as it looks. If you find a bird on the ground or in trouble, please contact me at 269-345-9211 or 269-598-8784 (cell).